Sharpless 155, also known as the Cave Nebula, Caldwell 9, or LBN 529, is a diffuse bright nebula within a larger nebula complex containing emission, reflection, and dark nebulosity, which is rich in color. It is located in the constellation Cepheus. 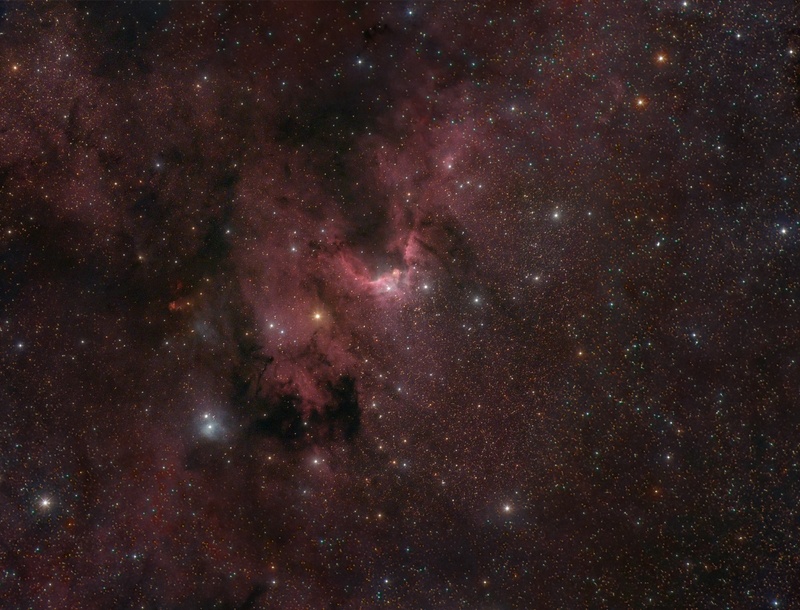 The nebula gets its name "Cave Nebula" from the dark lane at the eastern side which ends at the brightest curve of emission nebulosity which gives the appearance of a deep cave when seen through a telescope visually. The bluish reflection nebula vdB 155 lies towards the lower left in this image. Cepheus/Cassiopeia Border Region, telelens photograph. Sharpless 155 - Cave Nebula in Hα, which is part of this image. Notes: A combination of Hα and single-shot color images taken on a side-by-side setup with two telescopes. All exposures were taken during my stay at the Großglockner-Hochalpenstraße in September 2015. See an Observation Report of this event (in German)..